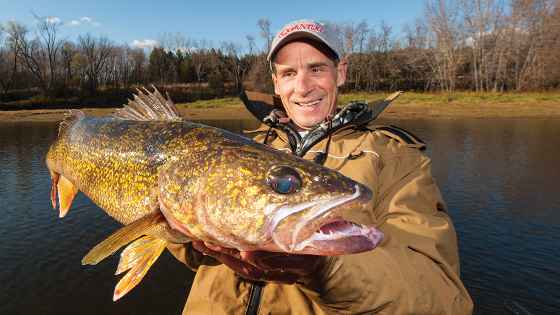 For walleye anglers, April showers bring more than May flowers. They also bring a thunderous river Shad Rap® bite, says legendary angler Al Lindner. Target shallow rocks near the mouths of tributaries where runoff from rain enters the main river channel. Fishing shallow is key, because spring runoff muddies up the river. Shallower water will be a little clearer — though not nearly as clear as water in lakes this time of year. And that’s why a Shad Rap, in these situations, will often outproduce the classic jig-and-minnow set-up. When you find shallow rocks near a tributary emptying into the main river, drop anchor so you can “work the spot quite thoroughly,” suggests Al, a Freshwater Fishing Hall of Fame Legendary Angler. The benchmark other crankbaits are measured by, the Shad Rap closely resembles baitfish found the world over. Constructed of premium balsa, it is equally effective cast or trolled, performing from ultra-slow presentations to super fast, without fail. Its precise action, detailed finish and proven fish-catching patterns make this a “must-have” bait for all anglers. Hand-tuned and tank-tested for perfection right out of the box, Shad Raps feature super-sharp VMC® black-nickel treble hooks.